This group consists of tightly wound belts. 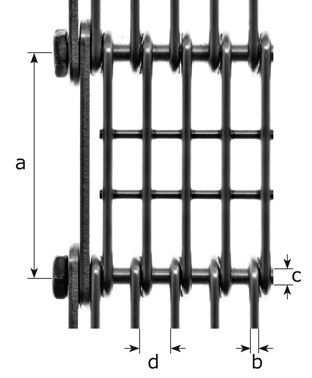 Alternate coils wound to the left and to the right bound together by means of grooved cross rods which prevents the spirals are drawn together towards the center. 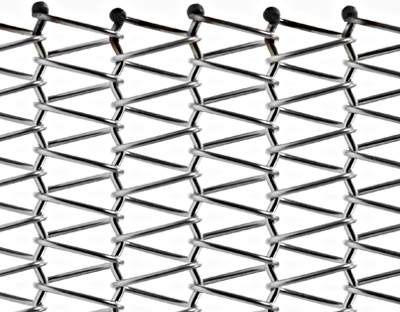 The end of these cross rods are connected by S-shaped hooks. 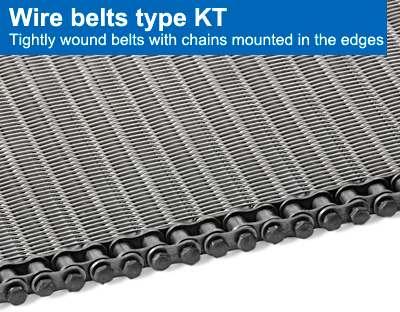 These belts are used in tunnel ovens in bakeries, among other applications. 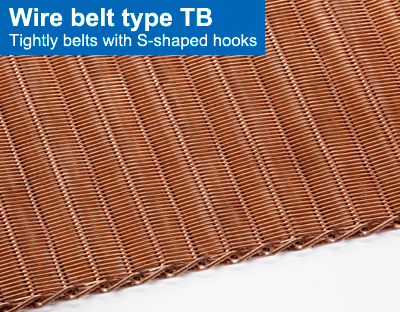 The belts in this group consist of alternate coils wound to the right and to the left which are joined with crimped cross rods. 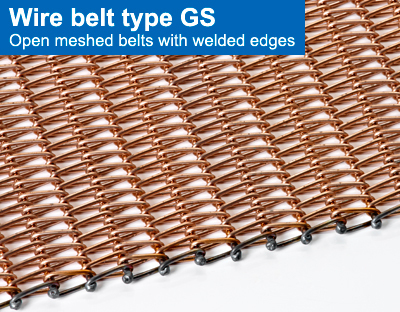 The edge of the belt in type GS is formed by the ends of the coil wire and the cross wire being welded together. 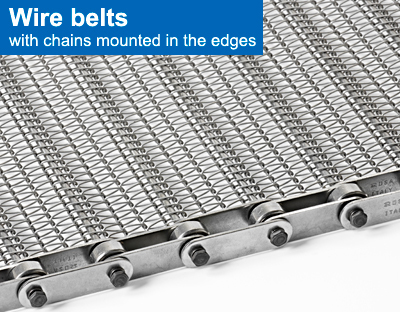 It is possible to manufacture these belts with very small pitch of cross rods. 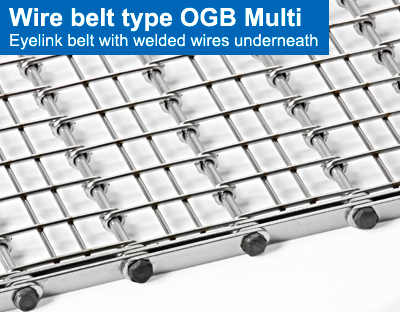 In type GB the cross wires are bent, i.e. 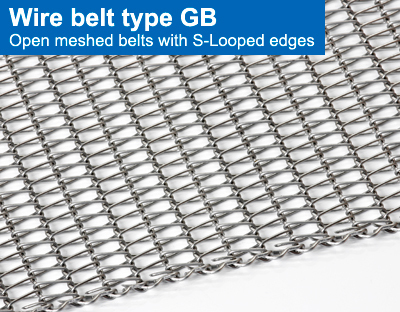 the cross wires are connected together along the edge of the belt via S-shaped loops. This results in a reinforced, straight belt edge. 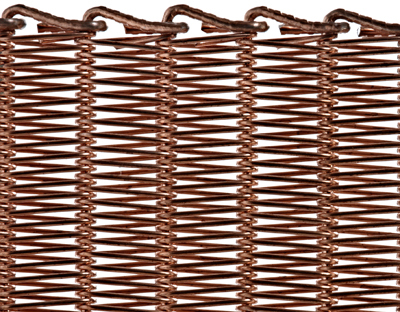 In this group the coil wires are plaited together and provided with cross wires which are welded at the edges. 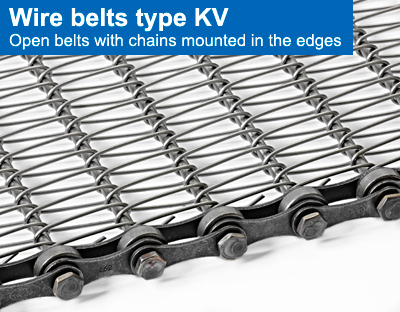 These belts are used mainly as conveyor belts in furnaces with high temperatures and high stresses for example hardening furnaces. 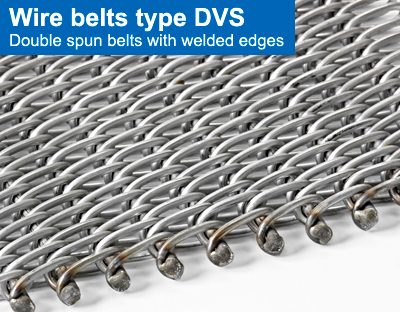 The belts in this group are open meshed or tightly wound wire belts furnished with chains along the edges. 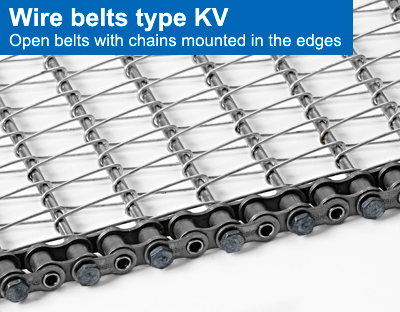 in most cases hollow pin chains are being used but also other types of chains and links are available, as well as side plates and flights. 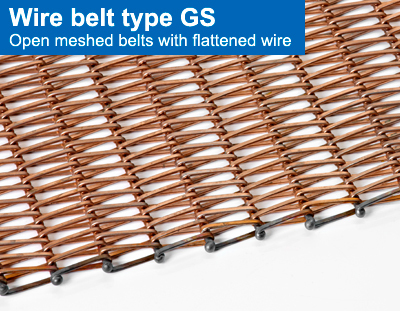 This type of belt is also called a wire loop belt as the belt consists of bent wire loops which are connected together with cross rods. 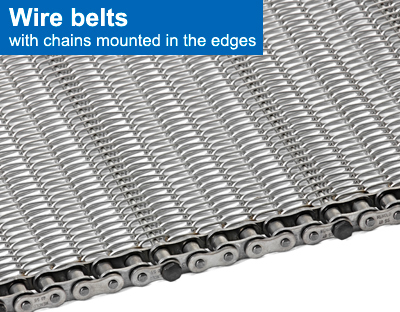 These belts are manufactured with reinforcement plates at the edges and inside the belt if required. 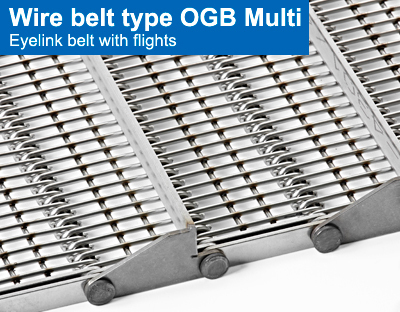 The belt can also be manufactured with flights and/or high edge plates. 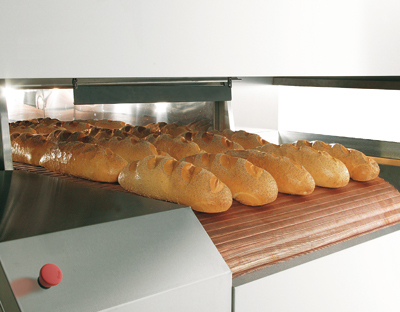 The drive wheels or drive rollers have milled grooves where the driving takes place across the full width of the belt with positive driving. 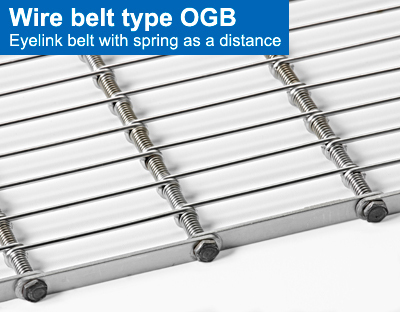 In order to increase the opening between the wire loops, the OGB belt can be provided with distance springs or bushes. 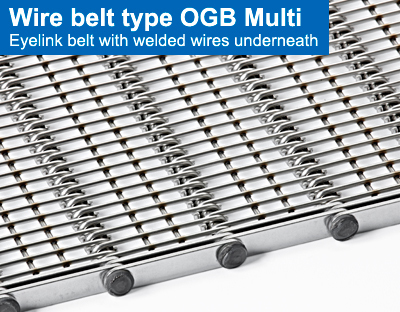 The belt type OGB Multi are manufacture with welded wires underneath to obtain the opening between the loops. 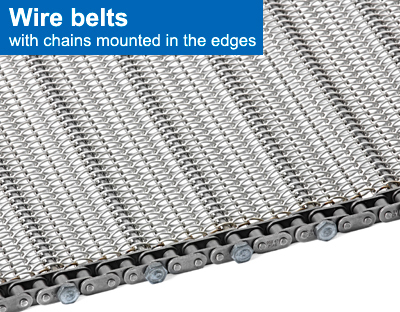 These belts with open area are used in cooling and drying systems where this is of great advantage as it promotes the circulation of the air. 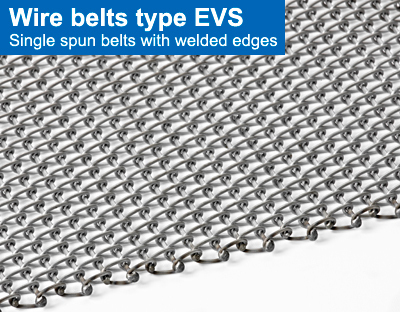 Wire mesh belts are ideal metal conveyor belts for light transfers. 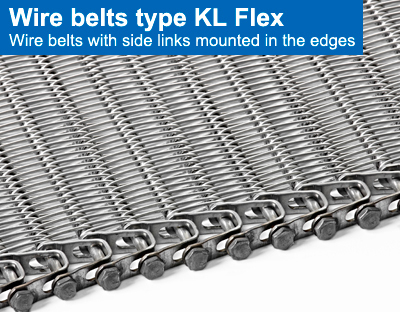 The large open area makes wire mesh belts the most efficient metal conveyor belt for many applications and a variety of processes. 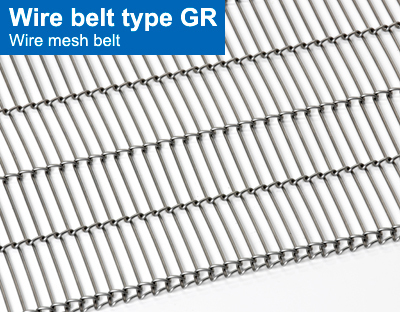 The belts are manufacture in spring wire and stainless steel wire. 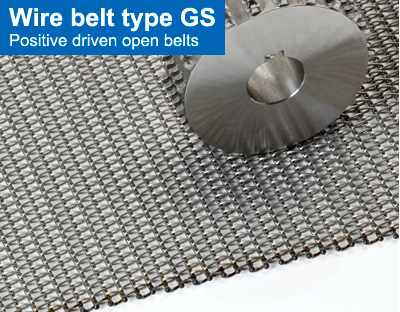 The belt is positive driven with sprockets. 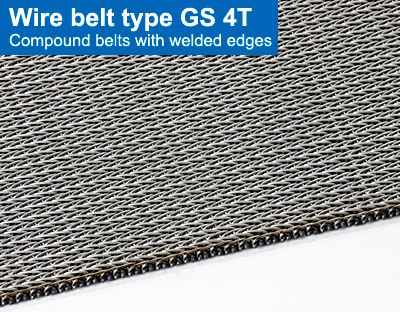 The material must be chosen on the basis of the environment and the temperature in which the belt is to be used.